Music bursts out of class, followed by the silence of intense concentration and the roar of laughter as young performers from Kinder to Grade Twelve learn to sing and act. The performing arts program at ExitLeft focuses on developing the voice, body and imagination, teaching students how to work as a team, develop communication skills and become creative on demand. Singers need to learn to tell stories which is where developing acting skills become important and actors need to be able to use their voices well which is best developed through learning singing. Our program is all about long term growth. The majority of our students start with us in primary school and grow through to the end of their schooling, making long term friends and developing into confident, creative performers, who aren’t afraid to tackle whatever life throws at them. Ignite the flame of your budding performer. ExitLeft’s class, for Kinder to Grade 2, develops performance skills in singing and acting through story and song. Kids develop creativity, musicality and learn how to follow direction. Watch your child bounce out of the car with absolute joy each week. Concerts and in-class performances for family and friends see Ignite students introduced to performing in a safe friendly environment. Kids in Grade 3-6 will accelerate their skills in ExitLeft’s singing and acting class. They will learn to work as a team and be creative on demand. Through singing and acting, accelerate kids develop confidence, giving them the skills to perform in front of anyone. The primary years are when kids develop life-long friendships, ExitLeft classes become the high point of the week. Students Blaze their own trail in our Grade 7+ singing and acting class. The studio feels like home, giving students a safe space to build amazing skills in interpretation and storytelling. Music bursts out of class, followed by the silence of intense concentration and the roar of laughter with impromptu ‘Glee Club’ style jam sessions breaking out. Blaze classes see students advance their technical skills as they work toward becoming elite level performers. Step into the inferno with ExitLeft’s class for advanced performers. Bridging the gap between High school and University this College class pushes the envelope. There is a big jump in expectation from music and drama offered in high school to what is expected when students hit College and even more so for those who want to audition for the big performing arts Universities. Students learn to deliver music and scripts featuring adult concepts, build believable characters and get advice and feedback on their College monologues and performance pieces. This class is free for Grade 11/12/uni students enrolled in the Blaze program. People often ask why ExitLeft students appear fearless when they perform. From an early age all our students are expected to learn together in a group whenever possible. It is easier for developing students to pick up musical technique when they are learning with and from each other. When combined with our individualised music lessons it becomes a winning combination that achieves fast track results. With technique being taught in class, our singing tutors focus on students’ individual vocal strengths and weaknesses. Material is carefully selected to challenge and grow each singer’s individual sense of style and performance. We work with students to build a safe foundation for their voice as it develops with puberty and give them the tips and tricks for creating great performances from their very first solo on stage through to Uni music exams. Select an individual lesson when you enrol and we will arrange a time that suits you. 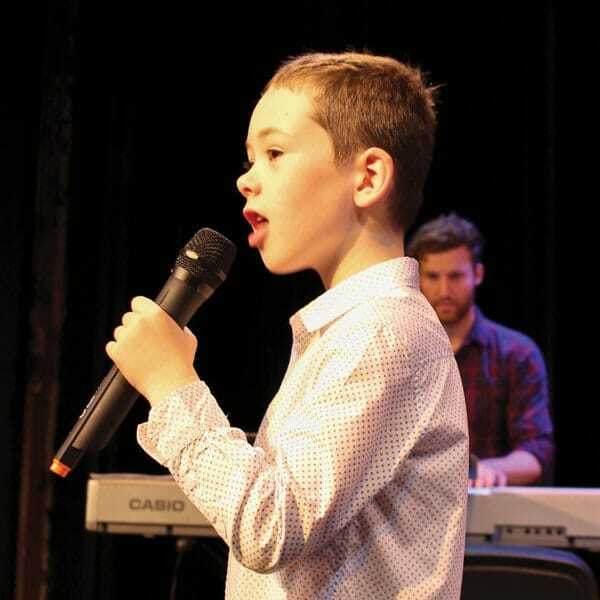 As a bonus, Students in the Accelerate, Blaze and Inferno Singing and Acting classes have the opportunity to join the Hobart Children’s Choir, shine in our ExitLeft Musicals and Plays and perform at corporate and community events. There is no extra charge for rehearsals for these bonus programs.